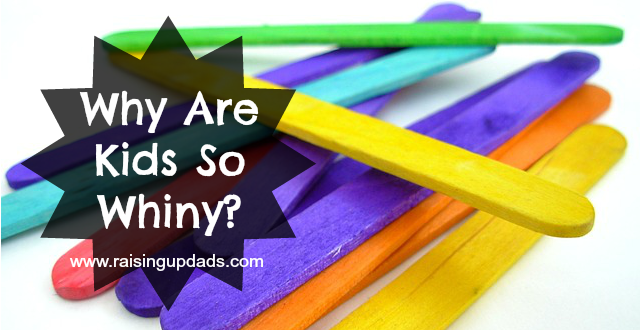 Why Are Kids So Whiny? Threat Level Medium: Why Are Kids So Whiny? I’m sure there’s an academic explanation based on sound child development theory for why kids are whiny. If I had to guess, the root of whining is either an evolved form of when babies cry for something they want or it’s a learned behavior kids pick up from their environment. Or it’s both to varying degrees. Or it’s neither and I just made both those answers up. Like I said, I don’t know. What I do know is whining is super annoying and a quick path for putting me in an awful mood. One of our daughters went through a particularly whiny phase a few months ago. Every request was made in an extremely whiny voice tone that made me deny every request being made – and I wasn’t very nice about it either. In any professional setting, my voice tone would have been considered extremely rude and possibly grounds for a visit to HR for creating a hostile work environment. At some point, I had a realization. (In other words, my wife called me out.) I was letting my kid influence my behavior rather than the other way around, and my response was not decreasing the whining. Thus, the “Popsicle System” was born. Every time our daughter made a request in a reasonable voice tone she earned a Popsicle stick. If she whined, she lost a Popsicle stick. At the end of the day, if she had 10 Popsicle sticks, she got to eat a real Popsicle. Each day she started over with 0 Popsicle sticks. Not surprisingly, the Popsicle system worked great! Within a few days our daughter’s whining had dramatically decreased and my mood was greatly improved. After a few weeks, we slowly stopped using the Popsicle sticks as her whining remained at a (reasonably) low rate. The focus of the Popsicle sticks was very specific to whining while making requests. I didn’t try to tackle fifty different behaviors at once or focus on a broad category of behaviors. Instead of getting angry with our daughter for being whiny, we merely had her lose a Popsicle stick. It sounds odd to say, but the Popsicle stick took the emotion out of the situation and allowed us to explain to our daughter what we expected of her rather than rudely dismissing her or giving in to the whining. During this time, she earned her Popsicle every single day. She lost plenty of Popsicle sticks, and there were even a couple close days. Our goal was not to deprive her of something she wanted but to teach her a better way to communicate what she wanted. Would love to read of any similar experiences you’ve had with your kids. Or if you have any questions on using techniques like this, feel free to comment or send a message through our About page, on Facebook, or tweet to @RaisingUpDads. Check out last week’s Problem/Solution post, Threat Level Low: I Hate Children’s Music! This entry was posted in Parenting Strategies and tagged child development theory, dads, family, fatherhood, fathers, motivation system, parenthood, Parenting, popsicles, whining, whiny kids. Bookmark the permalink.